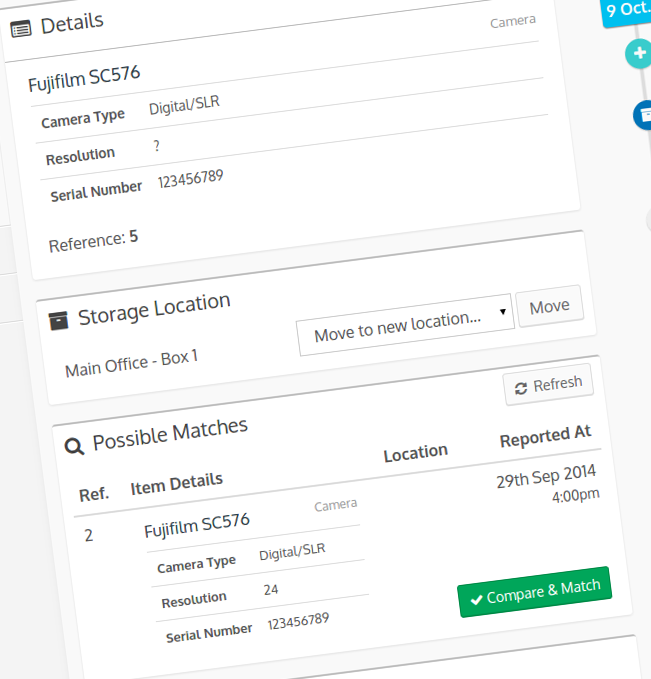 Manage your organisation's lost and found items online, with our cloud software. We'll help you be the master of your lost property! 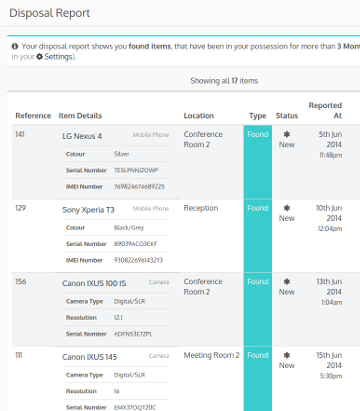 Simple but powerful software for your company to record and track items you've found, and items that are reported as lost. Our industry leading cloud-based software will help you return lost items with their owners with ease. Add items reported as lost, and items you've found, quickly and easily in your control panel, and place our lost item report widget on your website's lost property page. Our clever matching system will automatically find matching lost and found items, allowing you to quickly return the item to it's owner. Once you've held an item for longer than your chosen period, our disposal report will let you know which items can be donated, recycled, or disposed. Why do you need ReclaimHub? Managing lost property using spreadsheets, notebooks, boxes in a cupboards, simply doesn't cut the mustard! Choose the simple, modern, and efficient approach to managing your lost property. We'll help you reduce administration time, and help you reunite that lost mobile phone with it's owner. Why not Try ReclaimHub Now... we know you'll love it! Whether you use a desktop, laptop, tablet, or mobile device, ReclaimHub works perfectly. We've designed your control panel to work on any device and in any browser. No matter what devices used in your company, you can be sure that we've got you covered. Maybe you use a tablet or mobile device whilst moving between sites, or switch between computers throughout the day, you'll experience the same great software without compromise. By placing our widget on your website, your customers can simply and easily report their items to you, reducing time spent by your staff on the phone, email, or face to face. 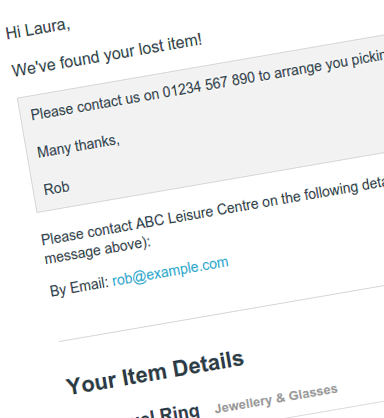 But should your customer still contact you directly, you can simply add a new lost item through your control panel. The quicker an item is returned to it's owner means less time and stress for all. We make it easy for you to match items with their owners, and notify them you've found their precious lost item. 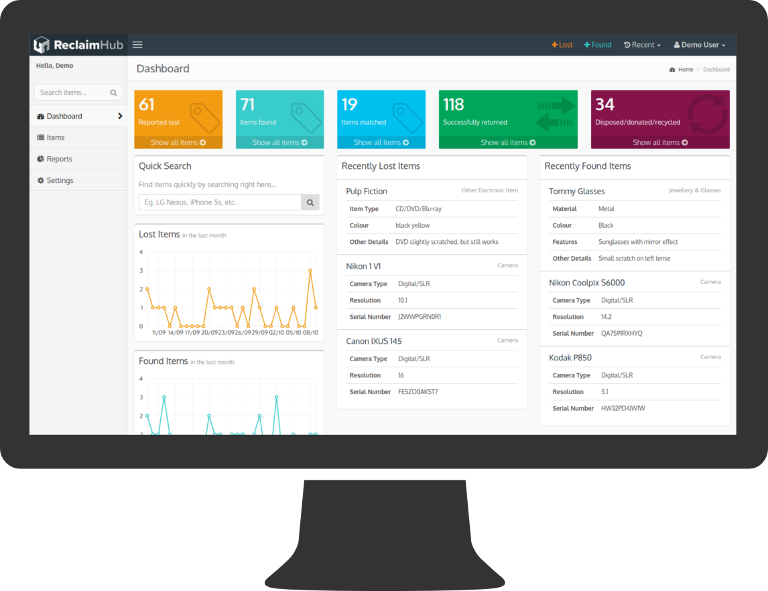 Produce quick reports across all your lost and found data. Discover which locations or events produce the most lost items. 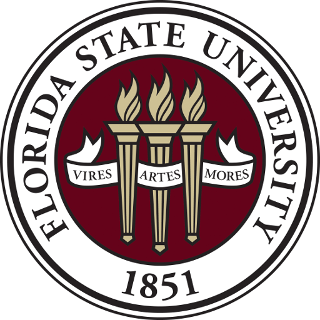 Find out which items are due to be disposed, or find out the percentage of items returned to their owners. We save you the digging around looking for a newly reported lost item. If you've already found it, we'll match the items so all you have to do is confirm the match, and the owner will be notified to collect their lost item. Take control of your lost property today!